Dimensions 26" x 6" x 12"
The ERSO 1020 FB - High Speed Heavy Duty Full Bleed (Gutter-Cut) Professional Automatic Electric Business Card Slitter. This new slitter is for full color business cards with 1/8" gutters between the cards and accommodates three different stock sizes with minimum time for change of stock. This model accommodates 8.5" x 11", 11" x 17" and 12" x 18" card stock. It allows you to produce 10 or 20 full color business cards (2" x 3.5") per sheet with a simple two-pass operation and a short time to reset guides. First pass cuts a sheet into 3.5" strips with a 0.125" (1/8") gutter between the strips, and then second pass cross cuts these strips down to finished 2" x 3.5" cards with a 0.125" (1/8") gutter between the cards. The infeed stack allows keeping up to 50 pages and cutting at a speed of up to 500 business cards per minute. NEW Feature!!! – guides adjustment for skewing elimination (procedure enclosed in manual). Resetting guides to accommodate different stock size can be done in 1 minute. 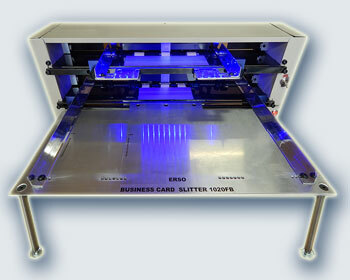 For an arrangement of business cards of slitter in stock, please contact us at sales@erso.us.